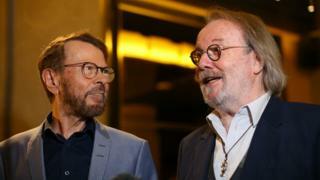 Benny Andersson has said he doesn’t feel Abba have “anything to prove” with their new material. Benny told BBC News: “I don’t feel that we have to prove anything, or I don’t feel we have to think about, ‘Oh, what if it was better before’, because maybe it was, but we can’t care about that. He also revealed further details about the sound of the two new tracks – but added that they haven’t been completed yet. “One of the songs is like we would’ve written it [for] today. The other, we could’ve written in 1972. So I don’t know, we’ll see. I mean, they’re not finished yet. The musical has just returned to London’s West End. The production, from English National Opera, stars Michael Ball and Alexandra Burke. Set in the Cold War, the musical tells the story of a chess tournament between two men – grandmasters from the US and Russia. As their rivalry simmers on the chess board, the pair also fight over a woman who manages the American grandmaster – but falls in love with the Russian. “Do not miss this bold, brash and brilliant revival,” said the review in the Daily Express. “It’s a mess,” agreed The Stage. “A gross disservice to a great musical. Benny, Bjorn, Agnetha, Anni-Frid and… Alexandra? Michael Ball said having to learn his character’s chess moves for the show was even more difficult than learning the songs and dance routines. “I have never done anything more difficult than learning chessography,” he joked. The chess games are exact recreations of those played by real-life grandmasters Bobby Fischer and Yuri Andropov – who the two main characters are said to be loosely based on. Asked what attracted him to the role, he said simply: “Benny and Bjorn.